This series complements our Napoleonic Naval range. It is based on the harbour and city of Toulon, France, 1793, at the time of the siege. The models were all built for an 8ft x 4ft diorama, the larger items being cast in resin, the rest in white metal. Some are based on actual buildings in Toulon while others are generic in design. Their style is appropriate to the 18th/19th century and so could be used in a variety of settings. Many of the resin and metal buildings will fit together to form larger models, eg the Brick Cathedral (RB12) is an impressive model in its own right but if required, there is a Tower (M29) or Porch (M30), which will form extensions. The diagrams for this series is set out over a series of pages. As this is a fairly long list, the links will be repeated at intervals. Please note: measurements given are of the base, height is to the highest point; all are approximate. Diagrams are not to scale. The buildings ref .RB1-10 and RB13 were modelled using plans and fa£ades of buildings actually in Toulon, 1793. Buildings of this period had long frontages with many regularly spaced windows, column and other architectural features which would be hard to reproduce accurately without the aid of a computer. They were produced using two machines - a circular/table saw with a fine, plastic cutting blade and a computerised milling machine with a digital readout which tells you where the cutter is to within a 50th of a mm! * A cordorie building is one which would have been used for laying up cables. Our model is taken from plans and facades supplied by the Maritime Museum in Paris, of the cordorie at Toulon, a building a quarter of a mile long!. There were buildings of similar length in all the major seaports to supply the various national fleets with cordage. ** Ravelins were located beyond the city wall. Their initial function was as a fortification, however, if and when overrun, defenders could fall back and fire down into the ravelin from the wall above. The triangular shape of the ravelin would force a wave of attackers to divide before attaining the city wall. and R10 with R11. They can also be used with a variety of our metal buildings. 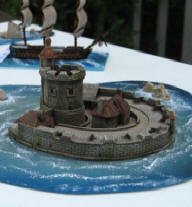 Price: £20.00 for set, or Castle only: £11.00; Keep only: £9.00. Based on Middleham Castle in Yorkshire which was built in the reign of Henry II. This extremely fine detailed model has detailed stonework on all faces. the dry brushing method of highlighting. Includes resin base with inlaid detail including two slipways, dry dock and two harbour buildings. Plus, in metal, a ship 'under construction', props to support vessel, separate dry dock gate and piles of timber and miscellaneous dockside items. The Inn is in resin, the outbuildings are in metal or resin. They can be arranged to form a square with a centre courtyard. Some of the buildings below are now resin cast or where multiple buildings - at least one in resin. * These buildings are now resin cast. # The wall section is copied from the front of the hospital complex at Toulon. It is useful for constructing any large municipal area with a courtyard. (T) These items were actually part of the dockyard complex at Toulon, 1793. Suitable for a small, village harbour. The set consists of 9 sections - 4 straight pieces plus angles and breakwater. All sections have detailed cast stonework. It is a versatile set which can be extended by the purchase of individual sections and/or used in conjunction with the resin docksides (RB17 and RB18). (RESIN ) Fort complex incorporating gun platform; castle; officers' accommodation; lighthouse tower..